This is a worksheet with a visual to help the students add up three addends. Each addend has two numbers that add up to 10. It is great for teaching students to add up two numbers they know and then add their final number. 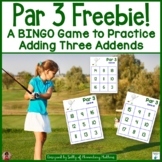 This pack includes four practice pages in which students add three addends. Students find the sum of the first two numbers in the addition sentence. They then write the sum of the first two numbers on the line below and add the last number to create a new number sentence. 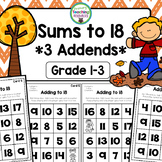 Common Core-aligned worksheet helping students apply the concept of adding 3 numbers/addends together with real-life experiences. This product contains 24 SCOOT cards. Each card has a number line that the students can use when solving their addition sentences. A recording sheet is included at the end of the file. 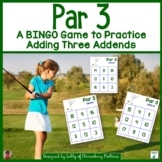 This engaging game is designed for students to practice adding three addends together! 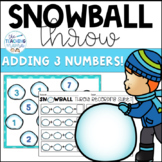 Student's will use cotton balls (snowballs) to toss on the game mat to determine the 3 addends! 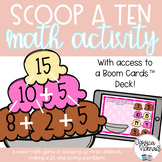 This product is great for a math center or math small groups! This is a quick, fun and engaging math activity. My students LOVE doing write-the-room activities. It gets them up and moving around, and produces high on-task behaviors! This math activity involves dice pictures to hang around the room and a recording sheet for students to add 3 addends. Enjoy! 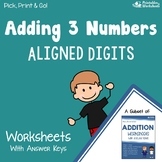 Six practice pages are included in this packet which can be used for individual instruction, small group and large group instruction, math centers, and even homework. Halloween themed adding 3 addends up to 5 using a manipulative like candy corn and jack-o-lantern mat. 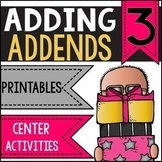 Also included are 3 addend addition cards.